This Passport is the perfect travel trailer for a couple or family of four to five. If you have been daydreaming about camping with your friends at the local state park, you can make that dream a reality. Just envision loading your clothing in one of the three wardrobes, and your dry goods in the double pantry. You can stow your larger camping items in the exterior pass-through storage then hitch up. 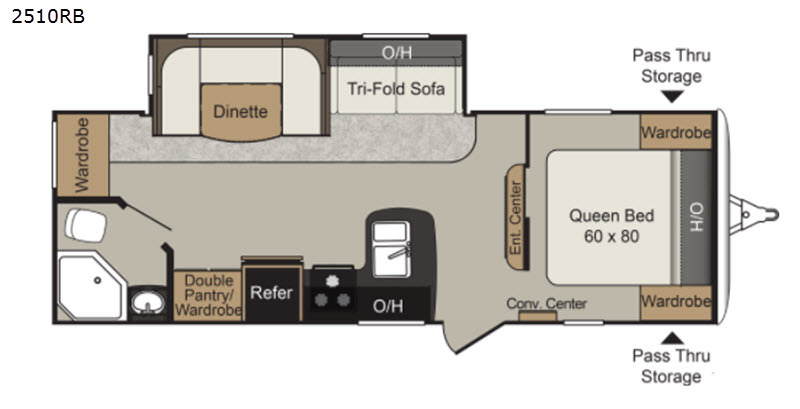 Once at your destination, let the slide open up the main living area for plenty of room to move around. You can began making lunch or dinner, watch TV while relaxing on the furniture, or go to bed in your own private bedroom. Daydreams can come true in this Passport model. The Passport Grand Touring models are lightweight and towable behind many SUVs and half-ton trucks. 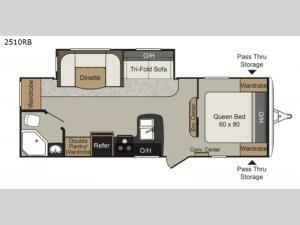 Each model comes with Load Equalization axles that reduce sway for an easy tow, and the unit has an enclosed, sealed and heated underbelly for four seasons of traveling. Once at your destination you can walk up the entry steps and grab onto the fold away exterior grab handle by the main door for support. You will find several residential style features such as durable Armstrong linoleum, furniture with high grade fabric, and raised panel hardwood cabinet doors. The exterior shower is very useful to get cleaned up before entering the RV, washing your pets, or even cleaning a few dishes outside. Choose your favorite Passport Grand Touring model today, and start making memories tomorrow!